On October 17, 2015, a new era in boxing history, at least from the Philippine point of view, will occur. The event would either be a bust or a blockbuster depending on how the Filipino boxing fans will respond to the challenge. The famed ALA Boxing Promotions of Cebu is coming to the StubHub Center in Carson, California to present their very first US promotions. And to show that they mean business, they are leaving no stones unturned to make the show a rousing success. They are bringing their best guys to the show. To help achieve their goals, ALA Promotions partnered with the giant Philippine TV outfit, the ABS/CBN. It would not be a surprise if many other notably famous corporations both in the Philippines and in the USA (Are you listening, Corona and Tecate?) will join in sponsoring the big event knowing that ALA Promotions has a great track record in putting up great events like the highly successful “Pinoy Pride Series”. ALA Promotions will showcase the very best of their stable starring the longest reigning Filipino boxing champion, Donnie Nietes of Murcia, Negros Occidental. Nietes has been a world champion longer than any Filipino boxer in history. He recently bested the record of the great Gabriel “Flash” Elorde of Bago, Cebu. Nietes is the current WBO World light flyweight champion. The date of the event will coincide with another great fight at the East Coast. Middleweight sensation and undefeated Gennady Golovkin is scheduled to meet David Lemieux at the Madison Square Garden in New York. In the undercard of their fight is a battle between Filipino-American former world champion Brian Viloria of Waipahu, Hawaii versus the world reigning WBC flyweight champion Roman Gonzalez of Nicaragua. In paper that may complicate the issue for Filipino boxing fans specifically those from California, Arizona and Nevada. Would they travel to the Stub Hub or stay home and watch Brian Viloria on HBO PPV. Thus, a great decision for the Pinoy boxing fans is on the table. Frankly, I would like these fans to buy the HBO PPV and support Brian Viloria and record it for later viewing. Then I would love to see them come in droves and fill the Stub Hub to the brim. It does not take much to fill the venue. It only seats 8000. Surely, there are at least that many Pinoys, perhaps even just at the cities surrounding Carson, like Cerritos and Long Beach, not to mention Los Angeles and nearby Orange and Riverside Counties. More importantly, filling up the StubHub Center will be a great chance to remove the stigma that is now a part of how Filipino boxing fans are identified particularly those from the Southern California area. It has been said and proven that many Filipino “boxing fans” only go to support Filipino boxers if they get in the venue for free like what always happens when Manny Pacquiao fights. It is now time to show the world that is not always the case! 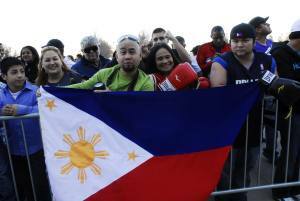 Many Filipinos are true boxing fans to the core and not just free loaders and opportunists! I therefore challenge the Filipino boxing fans within 5-6 hours drive to Carson or perhaps even further to show the world that they are not fake boxing fans; that they can well afford to channel their efforts and resources to support Filipino boxers. They should not allow themselves to be identified with the few that are only “fans” if they get free tickets or they make money off the boxers. I also like to challenge the Filipino politicians and movie stars and celebrities that come to see Pacquiao fight in Las Vegas and Macau, to show their worth and put their money where their mouths are. I would like to see them prove to us that they are not just free loading leaches or rather, supporters of Manny Pacquiao but are true Filipinos boxing fans by spending their own money to fly to LA not only to support the ALA Promotions’ initial venture in the USA but Philippine boxing in general. Spending money to see the ALA Promotion event at the StubHub is well worth it. It will be a great chance to see in person the future of Philippine boxing like the Pagara brothers, Mark Magsayo and a few others. In addition, it will also afford us a great chance to wave the Philippine flag and show our nationalism and love of the country and cheer against the Mexican boxing fans that without doubt will flock to the StubHub in support of their compatriots fighting the Filipinos because these folks know when a good fight is happening. There is no doubt, the moral of the Filipino fighters who will be featured in the fight card will elevate to the shy when they see our flag proudly waving and hearing their countrymen, Filipino politicians and celebrities at ring side cheer them on as they battle for the Filipinos. See you all at the StubHub on October 17, 2015!